This is the first game in the Tomb Raider series. For other games in the series see the Tomb Raider category. For the 2013 reboot, see Tomb Raider (2013). Tomb Raider, developed by Core Design, is a popular video game originally released for Windows, PlayStation, and Sega Saturn. 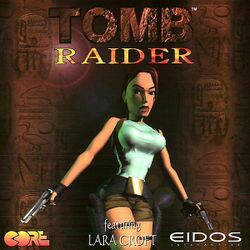 A game of this type was never before seen, with amazing three-dimensional graphics (for the time), an epic score, a new and strong female protagonist, and innovative gameplay; it catapulted the PlayStation's success and fame and introduced the world to Lara Croft, who is one of the most well-known video game characters to date. The gameplay is heavily influenced by several adventure movies such as Indiana Jones, where Lara must travel through several levels dodging traps, encountering dangerous enemies, and exploring ancient sites. The player has the ability to save their game at will in the PC and Mac versions, while PlayStation and Saturn users must use save crystals which are only good for one save and are only at certain locations, making the game that much more challenging. The player must also solve various puzzles and challenges they encounter to progress through the story. After Lara Croft returns from an expedition in the Himalaya Mountains, she is contacted by Jacqueline Natla, a conniving and wealthy businesswoman who convinces Lara to recover a mysterious artifact from the tomb of Qualopec in Peru. Wasting no time, Lara sets out on her quest to find one of the three pieces of the ancient Atlantean Scion, a talisman of incredible power. Little does she know that the Scion will lead her to an incredible journey that will span the entire globe.